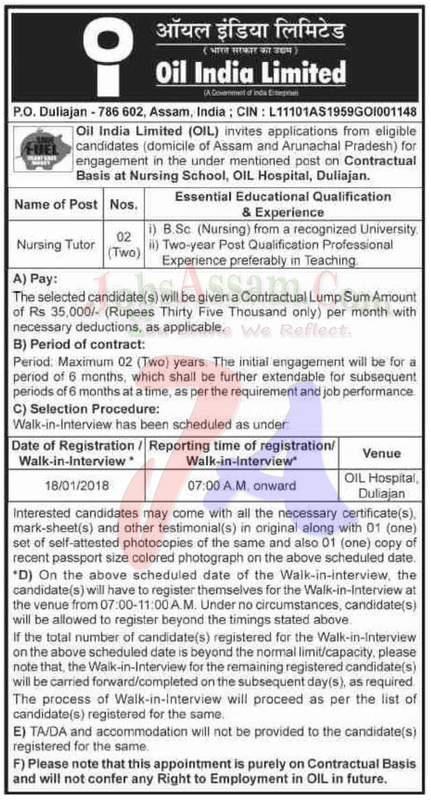 Oil India limited, Duliajan Recruitment 2018 - Nursing Tutor - Walk in : Oil India limited, OIL Duliajan invites applicants (domicile of Assam & Arunachal Pradesh) for engagement of contractual post for Nursing Tutor at Nursing School, Oil Hospital Duliajan. a)B.Sc (Nursing) from a recognized university. b)Two year post qualification professional experience preferably in teaching. Selection Procedure: Walk in interview . How to apply : Interested candidates are requested to bring all the relevant document with one passport size photographs at the time of interview. Venue: Oil Hospital Duliajan Time: From 7 AM onwards.